How many organizations does it take to save a stream? While that may sound like the opening to a bad joke, the answer is several. 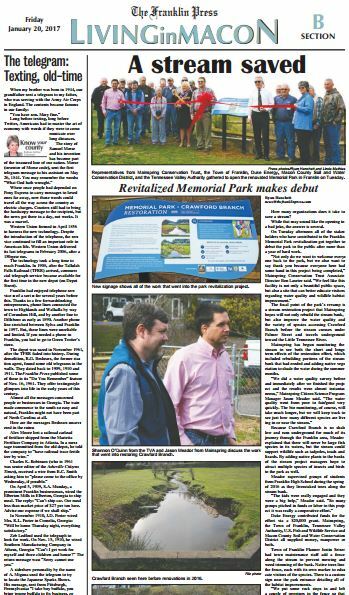 On Tuesday afternoon all of the stakeholders who have contributed to the Franklin Memorial Park revitalization got together to debut the park to the public after more than a year of hard work. The focal point of the park’s revamp is a stream restoration project that Mainspring hopes will not only rebuild the stream bank, but also improve the water quality and the variety of species accessing Crawford Branch before the stream crosses under Palmer Street and travels underground toward the Little Tennessee River. Mainspring has begun monitoring the stream to see both the short and long-term effects of the restoration effort, which included rebuilding portions of the stream bank that had eroded and adding native vegetation to shade the water during the summer months. Because Crawford Branch is so shallow and runs underground for much of its journey through the Franklin area, Meador explained that their will never be large fish species in its waters, but the stream could support things like tadpoles, toads and lizards. By adding native plants to the banks of the stream project managers hope to attract multiple species of insects and birds to the park as well. Meador supervised groups of students from Franklin High School during the spring of 2016 as they live-staked trees along the stream bank. Duke Energy contributed funds for the effort via a $20,000 grant. Mainspring, the Town of Franklin, Tennessee Valley Authority, U.S. Fish and Wildlife Service and Macon County Soil and Water Conservation District all supplied money, manpower or both. 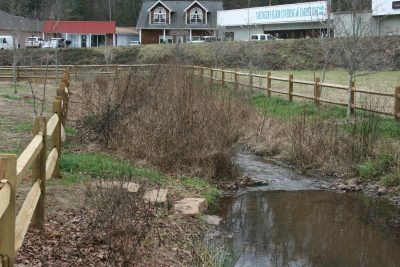 Town of Franklin Planner Justin Setser had town maintenance staff add a fence along the stream to prevent mowing and weed eating of the bank. Native trees line the fence, each with their own marker to educate visitors of the species. There is a custom sign near the park entrance detailing all of the habitat improvements that have taken place. Along with the stream restoration, the Town of Franklin board of aldermen approved $9,250 to resurface the basketball court and additional funds for four new basketball goals. Setser noted that new playground equipment could be in the park’s future, but no plans are finalized at this point.